Boiling is one of the easiest methods for cooking rice. The grain is cooked uncovered in a large quantity of water. 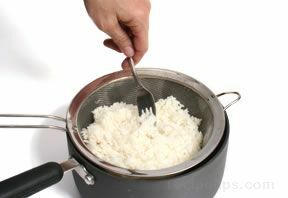 The rice and water are then dumped into a colander and drained for several minutes to remove the excess moisture. This method is often the best when there is some doubt as to the correct quantity of water that can be absorbed by the rice. This technique is similar to cooking pasta. 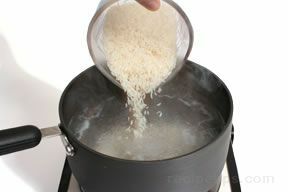 Using a large heavy-bottomed pan, add 5 to 6 cups of water for every cup of rice that will be cooked. 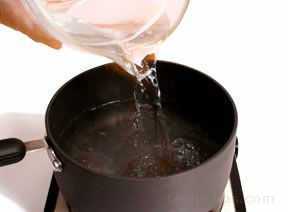 Bring the water to a boil, add 1 cup of long-grain white rice, and return to a boil. Reduce the heat and simmer the rice uncovered for 12 to 15 minutes (long-grain brown rice requires more time) or until the rice is cooked to the desired tenderness. Drain the rice in a strainer. 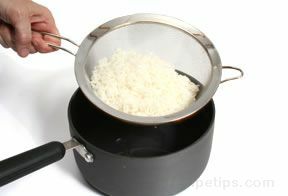 Dump the rice back into the pan or place the strainer of rice over the pan. Cover the rice and let it stand for about 5 minutes. Fluff the rice with a fork prior to serving. 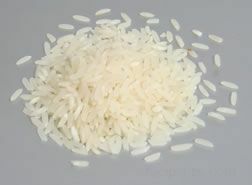 One cup of uncooked rice produces about three cups of cooked rice. 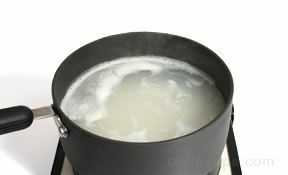 The boiling method is a more reliable technique for people who do not cook rice often, but it does have one major disadvantage: When the rice is drained and rinsed, many of the nutrients are washed away. Note: When using the boiling method for cooking rice, do not add salt to the water because it will lengthen the cooking time. 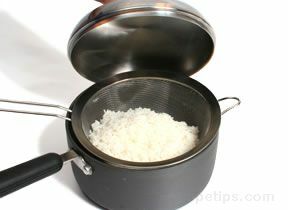 Salt can be added to taste after the rice is cooked.